Did you know that smartphones are ‘equipped’ with secret codes that can unlock (or lock) a number of different functions which propound a service known as "Unstructured Supplementary Service Data (USSD)" or backdoors. We mostly know this as "quick codes", secret code or "feature codes". This code is an extra UI protocol, which allows people to access hidden features. If we come to trace the origin of this protocol, it was originally created for GSM phones which can also be found on CDMA devices in some cases. They are accessed by inputting them into the phone's dialer (it can be found on the phone home screen which is mostly green in color) and usually begin and end with the * or # keys with a sequence of numbers in between. These are available publicly as a back channel that allows users to directly communicate with their service provider. The most tricky part is that most people don't really need to know how their local cell towers are performing or what their IMEI number is which is not supposed to be because this are part of the hidden features you have to fish out first when you own a phone. Today, as this topic above is concerned, we will provide you with the list of codes to fish out hidden features on your device. These codes seldom work across different carriers, OS, or phone models (or even on generations of the same model). Now, we are moving, check out these list below for codes that mostly worked on all devices. What is Call Forwarding? This is a feature of some telephone switching systems which redirects a telephone call to another destination, which may be, for example, a mobile telephone, voicemail box or another telephone number where the desired call party is available. To carry out this operation, Dial *#67#. 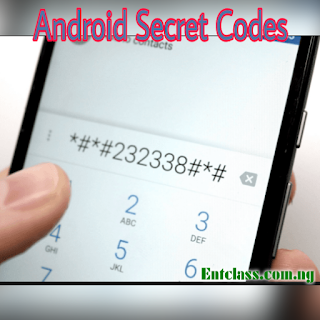 Once you enter this code above, it allows you to check which number your phone is currently forwarding calls to when you're busy or reject a call. This carries a voicemail but you can change it to forward to a different number or even third-party answering service. >>Go to Settings >>Click Phone >> Tap on Call Forwarding. >>Go to Settings >>Call Settings >>Select the Sim>> Call forwarding. From there you can set a call forwarding feature or disable it if activated. This code prompted a pop-up on Galaxy device that let you know how long until a call is forwarded to the message center. On the iPhone, you can dial on *#67#. if you are using Samsung Galaxy S7 Edge and you enter this code above, it brings up a menu with a number of one-tap test prompts. NOTE: The first test is "Melody," which prompts a jaunty little K-Pop diddy. What is Firmware? · Firmware is software that's installed on a small memory chip on a hardware device. Firmware allows hardware to be updated. It will let you know your phone's current firmware. What is Field Mode? This is a software application often pre-installed on mobile phones that provides the user with technical details, statistics relating to the mobile phone network and allows the user to run hardware tests on the phone. >>Press the green call button to access "Field Mode," which can give you access to info about local networks and cell towers. I could only get this to work on Android. But this prompts a library of different phone operations, which could be operated with a single push (e.g. Sleep, Front Camera, Vibration). What is IMEI? IMEI full meaning is "International Mobile Equipment Identity" The IMEI is a number, usually unique, to identify 3GPP and iDEN mobile phones, as well as some satellite phones. >>Tap the "call button" to prompt your IMEI number or your International Mobile Station Equipment Identity number. This only works on postpaid plans. To do this, simply dial *646#. This one does not work on iPhone but work on my Galaxy phone but must have an unlimited texting plan from AT&T. So, a pop-up message will show Instead of showing the info on a new screen. This doesn't work on iPhone also but work on Android, so to do that, dial *225#. You will get a message telling you about your current balance. What is Caller ID? Caller ID is also known as Caller identification which lets your friends, family and business contacts know you're calling them. When you have set up caller identification, your mobile number or Skype Number is displayed when you call mobiles and landlines from Skype. You can hide your phone caller ID against another caller and this only work on Android. Once you enter this code, you will notice a pop-up message stating that "my Caller ID had been disabled". In order to re-instate Caller ID, Just dial *31#, it will automatically reinstate the caller ID so you make use of it anytime, any day. What is Billing Cycle? The billing cycle for a credit card or any type of monthly account is the period of time between billings. For instance, a billing cycle may start on the 1st day of the month and end on the 30th day of the month. Or, it may go from the 12th of one month to the 12th of the next. To check your billing cycle, Dial *3282#. This works on Android also, once you type the above code, It will prompt you an SMS message with my billing information. What is SMS Message Center? it's a network element in the mobile telephone network. Its purpose is to store, forward, convert and deliver Short Message Service (SMS) messages. This code will tell you your SMS message center number. Call Waiting is a service whereby someone making a telephone call is notified of an incoming call on the line that they are already using, and is able to place the first call on hold while the second is answered. To activate call waiting, simply Dial *43#. Once you dial that code, it will activate call waiting and then you can deactivate anytime you like by dialing #43#. That's all about that. For any opinion or suggestion, pass it across to us as soon as possible using the comment box below. This post was written by Uche Francis. He is a Blogger, Self-Published Author, and Content Creator who is mostly online, preaching to the world about technology and providing solutions to tech-related issues through his tech blog http://www.TechDavids.com. A tech fan base for all Naija Youths with like minds. A very nice and insightful article, thanks for sharing. Wow! Honestly, I was captured by the topic of this post. Well prepared and straight forward post. good information, this Will really help us a lot in bringing out some useful functions of android phones.